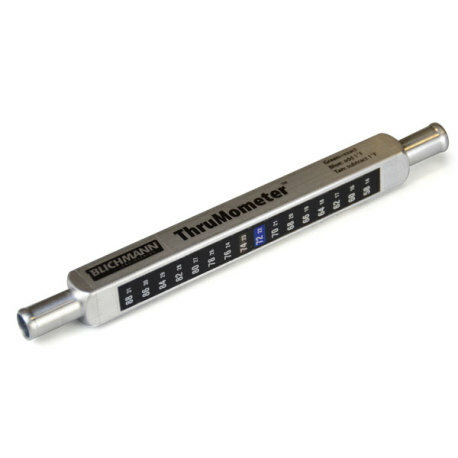 The Thrumometer from Blichmann Engineering is a handy thermometer that uses a liquid crystal thermometer to deliver almost instantaneous, accurate feedback on temperatures of liquids that flow through it, meaning on-the-spot adjustment of flow rates to compensate for too hot or too cold wort, meaning that you can get your wort to the perfect temperature! With a smooth, easy-to-clean interior, there is nowhere for harmful bacteria to hide. Made of high-quality, corrosion resistant aluminum, there is never any need to calibrate the Thrumometer. 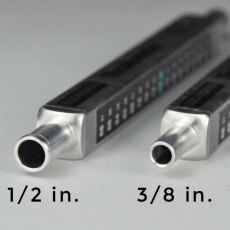 Have the option of either a 3/8 or 1/2 in. barb depending on your tubing. Made for lifetime use, there is no better inline thermometer! ThrrMometer works amazingly. Able to tell the wort temperature after the chiller as it is transferred to the fermenter.